Charles Lindbergh's 1927 solo nonstop transatlantic flight from New York to Paris was a sensation and sparked a large interest in aviation worldwide. During November of 1928, the Aeronautical Corporation Of America (Aeronca) was founded in Cincinnati, Ohio, USA, with the intention of starting light aircraft mass production for the private owner and pilot. 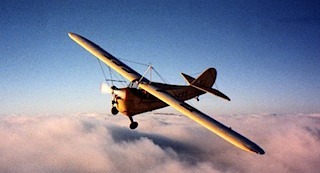 The Aeronca Logo © Aeronca Corp. 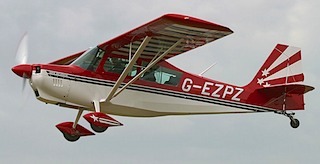 The company acquired the design rights to Mr. Jean Roche's successful single seat homebuilt aircraft. In 1929, it became Aeronca's first aircraft design, called the C-2. Its engine delivered 29 hp! 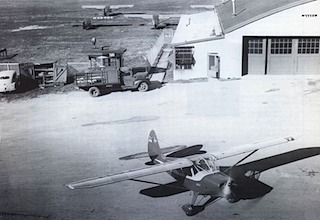 In 1935, the C-2 became the C-3 "Collegian", when a second seat in side by side configuration was added and a slightly stronger engine of 35 hp was installed. The later C-3 "Master" variant even offered an enclosed cockpit as well as an improved landing gear. Between 1929 and 1951, Aeronca produced a total of 17'408 airplanes in 55 different models. It would be beyond the scope of this website to list all of them. But the most successful model, the 2-place 7AC "Champion", of which 7200 were built, cannot be left unmentioned. Currently, only two of them are flying here in Switzerland, HB-ETD and HB-ETF. The last model manufactured by Aeronca was the 15AC Sedan which this website is all about. The picture below shows a Sedan, engine running, on the Aeronca factory tarmac, in the year 1947. To learn more about the Model 15AC, click Here. Aeronca 15AC Sedan © Aeronca Corp. The original Aeronca factory was located at the Cincinnati Lunken airport, Ohio. In 1937, the great flood of the Ohio River drowned the roofs of all the Aeronca buildings beneath several feet of water and caused major damage. Luckily, most aircraft could be flown or hauled to safety, in time, but many airframes still fell victim to the water. Production resumed, only two months later! Nevertheless, the search was on for a safer location. 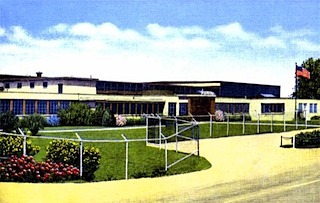 In 1940, Aeronca moved into the new plant at Middletown, Ohio, where production of airplanes continued, through 1950. 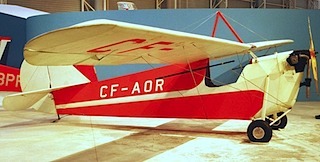 Although, the last Sedan left the factory only a year later, assembled from remaining stock by a few Aeronca employees for use in their company flying club. Aeronca Factory, Middletown, Ohio, 1953 © Aeronca Corp. 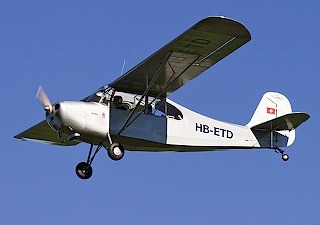 The Aeronca design, slightly modified, lived on, though: From the Champion Traveller and Challenger to the Bellanca Citabria, Scout and Decathlon and today's American Champion Aircraft line of airplanes, all were derived from the 1940s Aeronca models. 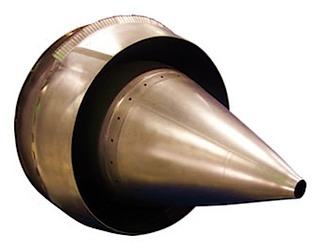 Jet Engine Exhaust Cone © Aeronca Inc.